In early 2013, British armed forces received a new standard sidearm. The Glock 17 was brought into service, replacing the venerable Browning L9A1 after over 40 years in the Mod inventory. 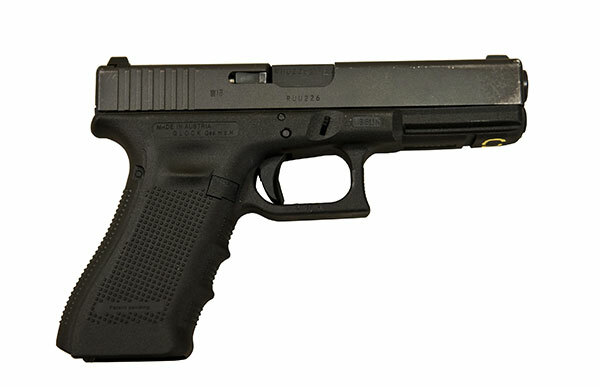 The Glock is a short-recoil locked breech semi-automatic pistol that fires via a striker-fired mechanism. Its frame, magazine body and other components are made from high-strength nylon-based polymer. Versions of the Glock have been around since the early 1980s. The 4th generation version features a dual recoil spring assembly which reduces felt recoil, enlarged, reversible magazine release catch and a slightly smaller grip. The Glock utilizes a double-stack magazine which holds 17 rounds of 9x19mm Parabellum, compared to 13 held by the Browning's. The Glock's a frame is made from polymer material which means that a fully loaded Glock 17, despite its higher magazine capacity, is still lighter than the Browning (905g vs 1000g). The Browning featured a manual safety release catch that increased the time taken to draw and fire the pistol. The Glock features 3 independent internal safety mechanisms - trigger safety, drop safety and firing pin safety. This arrangement means that a Glock with a round loaded in its chamber can be drawn and fired without further delay. Mil-standard rail that allows for the mounting of gun lights and laser pointers. Sights can be easily replaced e.g. swapped for night/low-light sights as needed. The MOD signed a £9m contract with the Viking Arms to provide the armed forces with more than 25,000 Glock 17 pistols and holsters. The Glock 17 was delivered first to troops serving in Afghanistan in January 2013 before being rolled out throughout all arms of the services. The pistol is carried as a secondary / backup weapon by frontline troops. In British service it is designated as the L131A1 General Service Pistol. A Royal Marine fires the Glock 17. Note the lanyard attached to a retention loop on the pistol's grip. The Glock 17 in service with the UK armed forces comes with a Safe & Fast Level 3 holster made by Italian company, Radar 195. This features a Locking on the Eject Port (L.E.P.) weapon retention system. The Glock 19 has a slightly shorter barrel and pistol grip than the fullsize Glock 17, making it easier to carry in a concealed manner. The pistol is small enough to be covertly carried in an inner waistband holster, making it suitable for Special Forces operatives working in plain clothes. Like its fullsize counterpart, the Glock 19 is chambered in 9x19mm Parabellum but, due to its shorter grip, its standard magazine only carries 15 rounds (the fullsize Glock carries 17). The 19, however, can accept Glock 17 magazines, including the 30 round ones from a Glock 18 automatic pistol.